That’s So Vegas!, the televised offshoot of vegasonlyentertainment.com is going gangbusters on the Internet. The fabulous Frankie Scinta’s guest appearance has garnered thousands of views on Facebook and other social media platforms. With a worldwide reach and dedicated social media presence, the WCOBM network is proof that traditional radio and TV are becoming relics of the past. 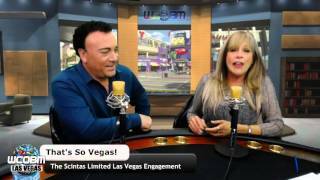 Click on each link below to view each commercial free ten-minute segment of That’s So Vegas! with Frankie Scinta of The Scintas. Frankie Scinta That’s So Vegas! Segment 1 – Get your Sicilian self on with Frankie Scinta of The Scintas-one of Las Vegas most loved and enduring music and comedy shows. Now playing at the Plaza Hotel/Las Vegas, the Scintas cover genres and engage generations in a power house show that has you chair-dancing, in stitches, and even shedding some sentimental tears. Frankie Scinta That’s So Vegas! Segment 2 – Frankie and the Scintas aid the Children’s Hospital in Buffalo, NY. Frankie shares the joy of knowing preemies are being healed and also how proud he is of his children and grandchildren. All with some Sicilian baddabing! Frankie Scinta That’s So Vegas! Segment 3 – Comedian, singer, impersonator Frankie Scinta tells about how he got a huge hug from President Ronald Reagan at the White House. Truly the experience of a lifetime. His great relationships with Tom Jones, Englebert Humperdink, Tom Jones and more. Frankie Scinta That’s So Vegas! Segment 4 – Versatile and talented Frankie Scinta wraps up a great show with humor and Sicilian values: teamsters and mobsters!